One of the most important items to have for your baby or child is safe and gentle body care products like shampoo, body wash, and lotion! There are specific things I look for when I am purchasing and using body care products for my children, including NO harmful ingredients like phthalates, SLS, and other toxic ingredients in many mainstream baby products! BabySpa has met all my expectations and beyond! 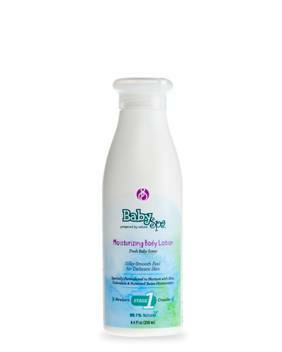 Unlike any other baby skin care line on the market, BabySpa is a line of natural lotions, oils, etc. that cater to the specific needs of a growing child's skin physiology by providing quality products that match up with key developmental progress and milestones such as crawling, walking and going to preschool. Made with the finest natural ingredients, including 5 ethnobotanicals (not available in any other baby skin care line), BabySpa nourishes the skin while meeting baby's sensitive needs and also making for a great bonding experience between a mother and her child. I love that they have separate products for different ages and stages of your child's life! It is so true that a child's skin changes as they get older so that is why it is important to have the right products going on their skin! I received a product for each of my children and their stages - the Stage Two Shampoo, Body Wash and Moisturizer and the Stage One Moisturizing Body Lotion. The STAGE TWO Tearless Shampoo, Body Wash & Moisturizer is a unique all-in-one formula created to gently cleanse and refresh your toddler’s hair and skin before or after a day full of outdoor activities. Exclusive to their blend, ECOCERT® certified Nyamplung Oil moisturizes while acting as a natural SPF booster to help protect the skin against sun exposure. Invigorating Rosemary softens hair while Organic Aloe, Chamomile, and Calendula soothe the scalp. Our 3-in-1 formula is rich in botanical emollients such as Shea Butter and Sweet Almond Oil to provide head to toe nourishment with a splash of our uplifting citrus scent. I love the list of ingredients in this Shampoo and Body Wash! It doesn't contain the HARMFUL ingredients but it does contain really helpful and UNIQUE ingredients to help my toddler's skin and hair! I love the Nyamplung Oil because it is a natural SPF. The mix of Calendula, Shea Butter and Sweet Almond Oil really soothe and moisturize my son's really sensitive and naturally dry skin! Plus, it doesn't contain Lavender which my son is allergic to so I really appreciate that! With the Stage One Body Lotion you can indulge your baby’s tender skin with natural moisturizers that are non-greasy and easily absorbed. It is formulated with patented Swiss moisturizers that provide an immediate soothing effect and long-lasting hydration. Nutrient-rich emollients such as Olive, Jojoba, and Grape Seed Oils are naturally blended with Songa™, an ECOCERT® certified and skin-conditioning botanical traditionally used by Ancient Native Americans, to gently nourish and soften your baby’s delicate skin. Infused with our signature baby fresh scent, our nurturing formula also combines Organic Aloe, Chamomile, and Calendula to provide instant freshness, a relaxing comfort, and a sensory spa experience. I love the unique ingredient of Songa that I have never seen in any other baby products! It is really gently on my daughter's skin and really moisturizes her sensitive skin! The scent is calming and fresh and I love the organic ingredients! It is great for putting on after a bath or for giving a gentle massage! If you are looking for body care products for your newborn through toddlerhood and beyond, then turn to BabySpa. You can pick a personalized product for your baby's age and the unique, natural and organic ingredients will really work! Buy It: You can purchase all BabySpa products on the BabySpa website.